Longtime Daimler CEO Dieter Zetsche’s replacement named, Nissan-Renault’s Carlos Ghosn isn’t going anywhere, all of you are terrible at driving and so much more on The Morning Shift for Wednesday, Sept. 26, 2018. Let’s do it! 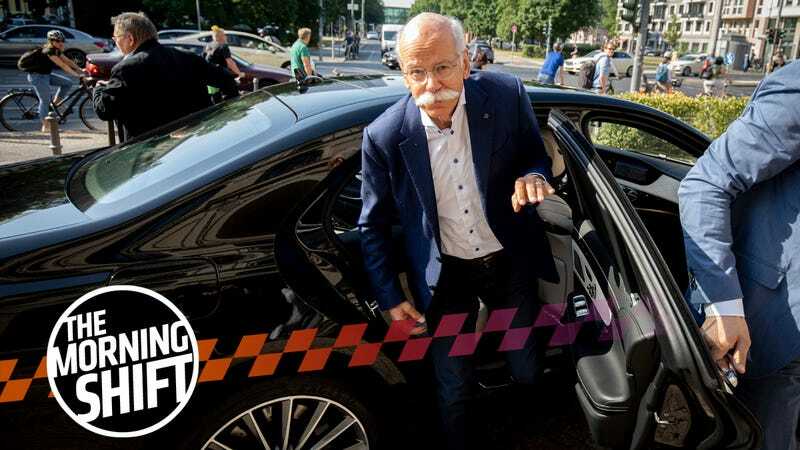 Mustache enthusiast and late-in-life blazer and jeans aficionado Dieter Zetsche has run Daimler AG for the past 12 years. (Before that we Americans largely knew him as “Dr. Z”, CEO of the former Chrysler Group, and we all know how that went.) In that time he’s become one of the auto industry’s most respected and recognizable figures, but at 65 an end to his tenure as been in sight for a while. Now we know who will take the reins at this most German of companies: A non-German, for the first time ever. In May 2019, 49-year-old Ola Kaellenius, Daimler’s R&D chief, will take over for Zetsche on the board of management of Daimler and as head of Mercedes-Benz Cars. He’s from Sweden! According to Daimler’s biography of him, Kaellenius is a lifer with the company who joined as a young manager in 1993. He’s done tours of duty in Alabama and Great Britain, and notably headed AMG from 2010 to 2013. Unlike Zetsche, he’s a finance and accounting guy, not an engineer. Kaellenius has worked to introduce Silicon Valley management techniques at Daimler. Together with Zetsche he oversaw an effort to sweep away layers of bureaucracy and encourage a more experimental approach to new products, changing a culture often slowed by strict hierarchies and meticulous planning. “Kaellenius can certainly ‘sell’ a new era better than alternative candidates could have,” said Juergen Pieper, a Frankfurt-based analyst at Bankhaus Metzler. The longstanding claim across the German auto industry that the CEO always has to be a engineer is “too simple in these revolutionary times with so many technological challenges,” he said. But there’s long-serving automotive executives and then there’s Carlos Ghosn, who’s headed the Renault-Nissan Alliance since 2000 and recently added Mitsubishi to that family. While he stepped down as CEO of Nissan last year and may move away from Renault in the coming years, the 64-year-old exec known for cost-killing has made clear he doesn’t plan to step away from the group as a whole for a long time. If ever. Carlos Ghosn, who built the three-way union of Renault SA, Nissan Motor Co. and Mitsubishi Motors Corp., said overseeing the group is a job he can keep adding value to and isn’t looking to relinquish. Ghosn will further reduce his roles at the three individual companies once his contribution becomes “limited,” the 64-year-old executive said in an interview in Yokohama, Japan. The continuing presence of Ghosn is set to soothe any uncertainty created by the companies’ plan to change the pact’s structure, possibly through a merger. Ghosn gave up his role as CEO of Nissan last year and has said that he may step down as CEO of Renault before his four-year term ends in 2022, fueling speculation the alliance could lose its architect and main leader for the past two decades. Great, Carlos. Plenty of time to get me the damn Nissan IDx after all. Or at the very least, a new Z. After two failed attempts back in 1999 (an extremely forward-thinking idea at the time, really) and 2010, Ford is finally ready to launch an online car sales platform in Great Britain. Buying a car on the internet???? Imagine that! All cars available on the www.buy.ford.co.uk site are purchased using Personal Contract Purchase finance, the most popular method of buying a car in the UK for private customers. The new car is delivered to the customers’ home and Ford works with an auction company to trade in their old car. A test drive can be arranged at a local dealer. Ford did not give sales targets for online sales. The idea could be rolled out across Europe if it proves popular. “The U.K. does a third of our volume in Europe, so it goes first, but other markets will be watching,” the spokesman said. I’m sure other markets will be watching! It’s kind of crazy that, besides Tesla (and even then, not in some states), you really can’t buy a new car online in 2018. One has to imagine that the immensely powerful dealership lobby in the U.S. will be resistant to this idea, if not opposed to it entirely, since it’s proven to be slow to change and married to doing things the way they’ve always been done. Or they could fight to get laws passed that require you to go through local dealerships for online purchases, rather than directly from the manufacturer like you would here. Anyway, it’ll be super interesting to see if this catches on in the UK. It could very well be the future of car buying. But many automakers are preparing for a possible future where people won’t even buy cars anymore. That’s a huge hedge on a bet, but it’s probably a smart move in case the industry eventually goes that way. Toyota Motor Corp., Asia’s biggest carmaker, is preparing for a potential future where people don’t buy cars. That’s behind the hefty investments that the company has made in ride-hailing providers, most prominently the $1 billion that it poured into Southeast Asian leader Grab. Toyota sees the partnership as an opportunity to get Grab to buy more of its cars and to push services like insurance and maintenance, Shigeki Tomoyama, the global head of Toyota’s connected car division, said in an interview this month in Nagoya, Japan. The pact with Singapore-based Grab forms the Asia prong of Toyota’s strategy to tie up with the strongest ride-hailing companies in each region, and then integrate its hardware and software into their services. Could the industry move entirely away from private car ownership, or at least, mostly away from it? I don’t think that will happen, but if it does it will take decades and not years, and certainly not in every market. In case it does, however, Toyota’s trying to be ready. Speaking of car technology: you’re bad at it! Congratulations! Well maybe not you, the Jalopnik reader, who I assume knows more about their own car and pays attention more than the average driver does. But in general, people are confused by new driver-assistance technologies. They’re overly dependent on them and not using them properly. That’s from an alarming study by AAA, reported on by USA Today. • Blind-spot monitoring: Nearly 80 percent of drivers don’t understand the limitations or thought that the system had greater capability to detect fast-approaching vehicles, bicycles and pedestrians. Relying too much on blind-spot monitoring, about 25 percent don’t look for oncoming vehicles when they change lanes. • Forward-collision warning and automatic emergency braking: Many drivers confuse the two. One is a warning system, while the other takes action. More than 40 percent of drivers don’t know these limitations. • Adaptive cruise control: About 29 percent of drivers who use this system, which accelerates and brakes on its own, are sometimes comfortable “engaging in other activities” while the system is activated, according to the study. This is definitely the trend we’ve seen in recent years, from infotainment systems all the way up to semi-autonomous driving systems: As cars become more and more high-tech, they’re increasingly above the abilities of many drivers. These systems are often helpful—the study says “technologies can prevent about 40 percent of crashes and 30 percent of crash deaths, according to federal estimates”—but they have to be understood and used right first. Neutral: Do You Struggle With New Car Tech? Do you use it right? Or do you ignore all that new crap and stick to your ’80s Mercedes-Benz?